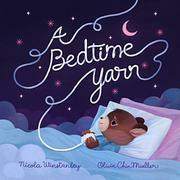 Balls of yarn help a little bear sleep and dream through the night. Frankie the bear goes to bed each night with a special task. He holds a ball of yarn in his paws, letting it unwind for his mother as she sits by the fire in the living room knitting a secret project. When the ball of yarn is used up, Frankie gets a new one in a new color. Each color sets Frankie to flights of fancy. Yarn in a “cool, foamy sea-green” sends him on an underwater adventure. Another ball “brushed his cheek with a damp, gray fog.” Yellow yarn transports him to a field of dandelions, while brown yarn makes him smilingly dream of a rich cake. All this keeps Frankie from being afraid to go to sleep. Finally, the last ball of yarn is unwound, and his mother displays her finished project on his bed: a striped, hand-knit blanket. Unfortunately, Frankie’s colorful dreams far outdo the very ordinary colors and design of the finished project. Winstanley’s bedtime tale tips from sweet to saccharine with love and affection. Mueller’s digitized artwork is colorful, but it’s also flat and lacks the texture that a ball of yarn and a blanket should contain.